Because Danbury-VITA never charges for its services and receives no funding from the government it must rely upon donations from individuals and businesses to remain in operation. We will gratefully accept cash donations, large or small. 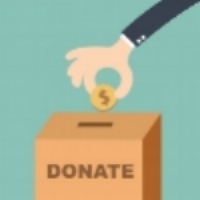 Danbury-VITA is a 501(c)(3) charitable organization and donations to it are tax deductible. If you don't wish to donate online, you may make a donation by check, made payable to the order of Danbury-VITA, Inc. Mail your check to Danbury-VITA, Inc., 152 Deer Hill Avenue, Danbury, CT 06810.